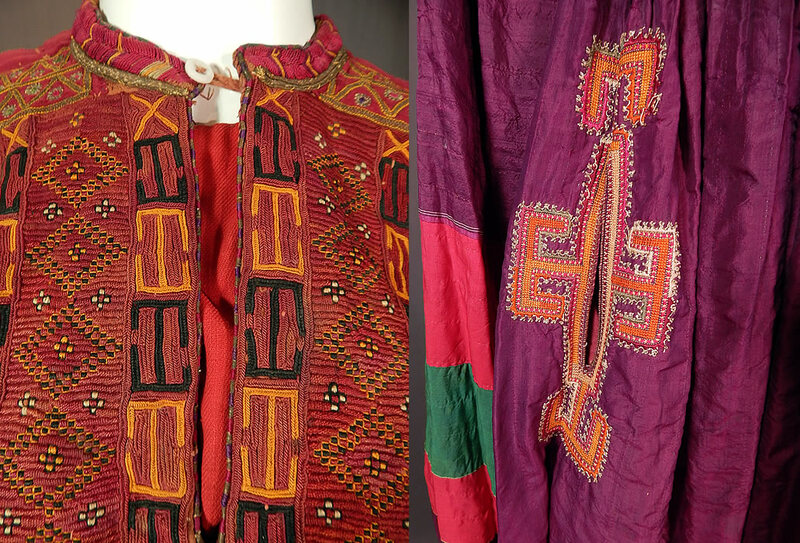 This vintage Afghan Uzbek suzani tribal ethnic embroidered boho bedouin kuchi dress dates from the early 1900s. 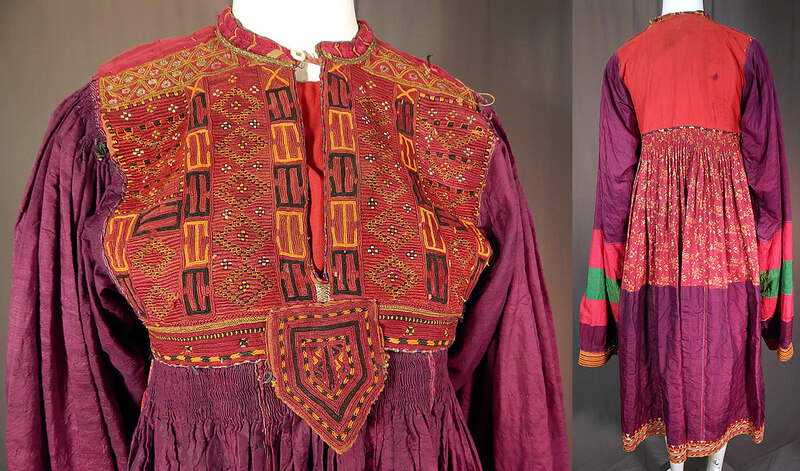 It is hand stitched, made of a mix of colorful cottons, prints, nylon fabrics pieced together in a patchwork style. 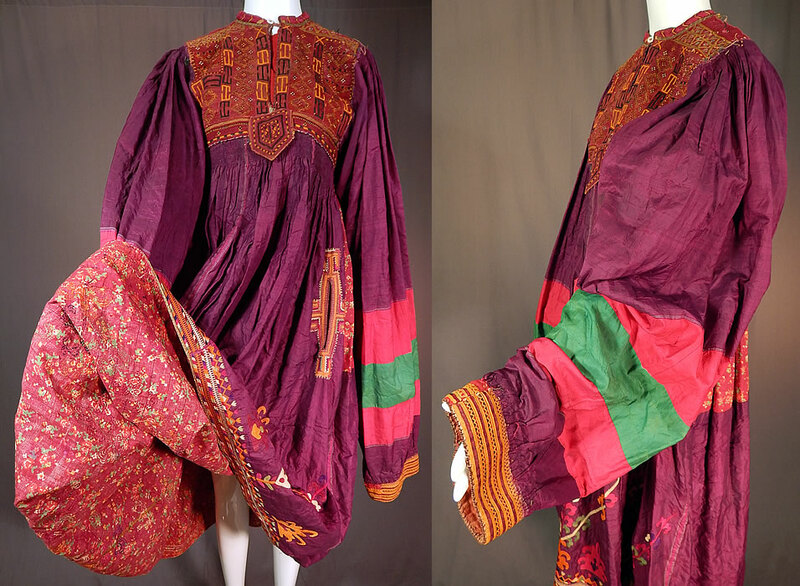 This unique custom made dress is a fusion of ethnicities, with an Afghan older gold metallic thread, red, black embroidered bib front yoke on the traditional kuchi style dress, an Uzbek suzani chain stitch embroidery work skirt front and former Soviet Union Russian red floral print cotton fabrics trimming the back and underskirt. 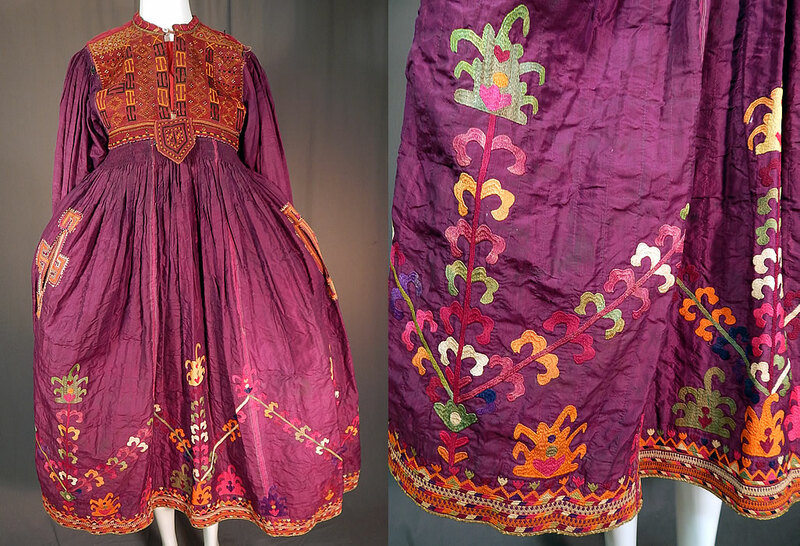 This stunning handmade hand embroidered nomadic bedouin boho gypsy style kuchi dress has a fitted high empire waist with pleated gathering, very long loose fitting exaggerated sleeves with fitted gold embroidered cuffs and open faux pocket slits on the full flared wide skirt, a single button closure at the neck with modesty red fabric insert inside the neckline and is lined in areas. 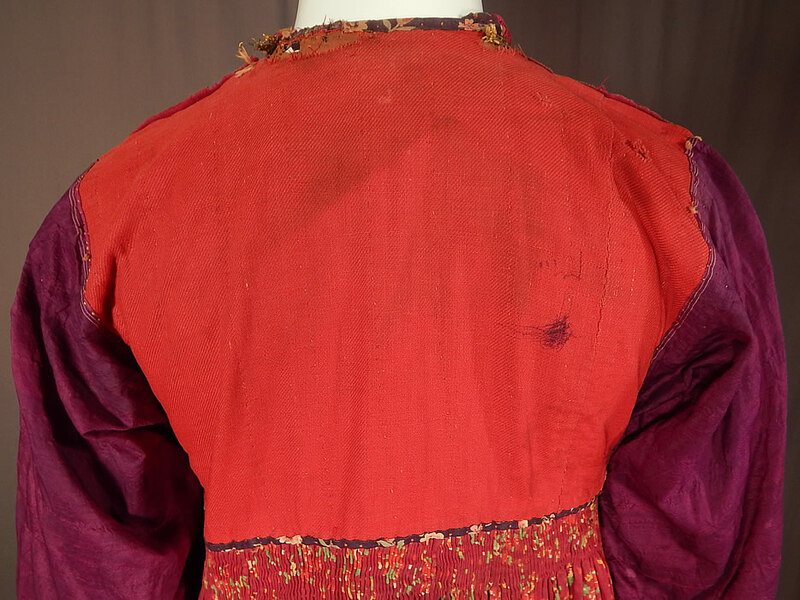 The dress measures 47 inches long, with a 34 inch bust, 50 inch waist, 36 inch long sleeves and 14 inch back. 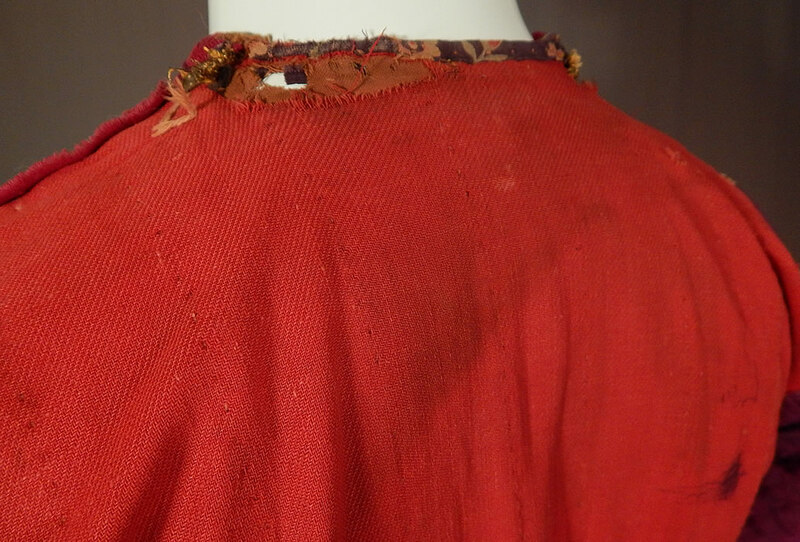 It is in good as-is condition, with some wear, faint fade discoloration stains on the purple nylon fabric, a few small black stains on the back top and some fraying, holes along the back neckline (see close-ups). 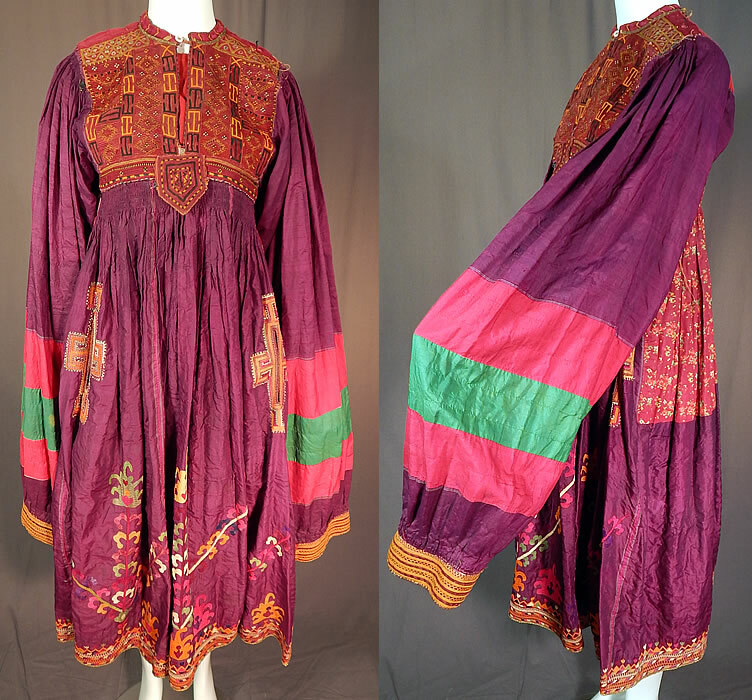 This is truly an amazing piece of Afghani and Uzbek colorful tribal embroidery boho wearable art! 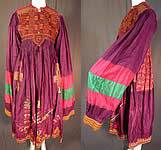 Buyer pays $16.00 shipping and insurance, USA orders.